Hewlett Packard have recently launched a new version of their Mediascape software and an accompanying website where the software and Mediascapes can be downloaded. Along with other artists myself and Paul Matson were commissioned to create a Mediascape using photography as the starting point. The piece had to be non location specific which meant that its content had to be generic in nature and the overall concept one that everyone could relate to. Paul and I chose to work with an underwater theme. Our aim was to create a Mediascape experience that would be instinctively recognisable by many people, and would require little explanation on how to use it. The piece is not meant to be a ‘realistic’ diving simulator, but through the use of sound and image provide the participant with a taster of what the actual experience might bring. 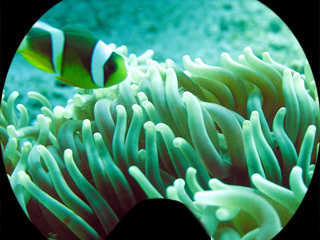 Simple animated slideshows suggest movement, while the sound complements and suggests potential diving scenarios. Scubascape is not competitive and contains no gaming element; it’s about immersing yourself in the audio/visual experience, exploring the four different dives and having fun.